Elaine was 65 when she suffered a stroke that left her unable to speak. She understood everything that was going on around her but couldn’t reply to questions or respond verbally in any way. She felt “locked-in” and was becoming very depressed. This affected her appetite and she began to eat less and less. She agreed to try some music therapy interventions to help her regain her ability to speak. Using a combination of short and simple familiar songs, as well as a technique called Melodic Intonation Therapy, the music therapist worked with her twice a week. To the woman’s surprise when the music therapist began to sing “Happy birthday to you…” she was immediately able to hum the melody. Feeling her vocal cords vibrate brought tears to her eyes. Using a xylophone the music therapist played short simple melodic patterns and the woman hummed them back. An amazing gain for Elaine – and it’s one of many success stories for the practice of Music Therapy. Not long ago I learned of an organization that uses this therapy as a way to help people and, in fact, to make profound improvements to their lives. 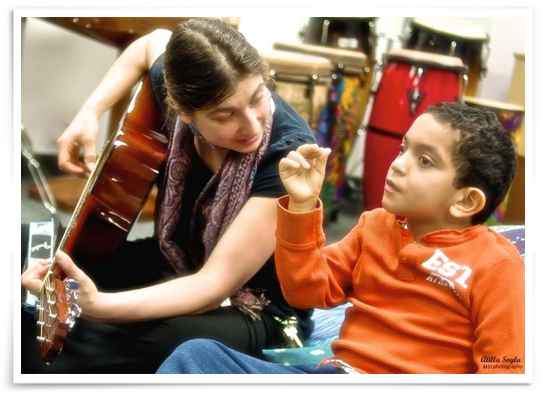 The Canadian Music Therapy Trust Fund (CMTTF) is a charity that supports accredited music therapists and programs to help people of all ages and needs through music. I thought learning more about what they do would be a great way to spend my recent Compass Campus Day. So I dropped in on the Music Therapy Centre in Toronto to get an idea of a typical day for them and to help out with the follow-up work for a recent fundraising event they had. As soon as I arrived I joined a group of teenagers there to find out about the centre for a high school Civics class. Chrissy Pearson, the clinical manager, outlined the huge scope of work they do in Music Therapy and the effects they commonly see. Using simple rhythms and sounds, complete songs or music composition, they can connect, motivate and move people. …to a preschooler with a brain injury able to regain her ability to walk. …to a boy with severe autism that can experience the pleasure of working in tandem with another. …to a senior afflicted with dementia able to sing along and even reminisce about his memories around the music. …to an adult with issues of past abuse and depression reducing his anxiety and opening the door to exploring emotional issues. 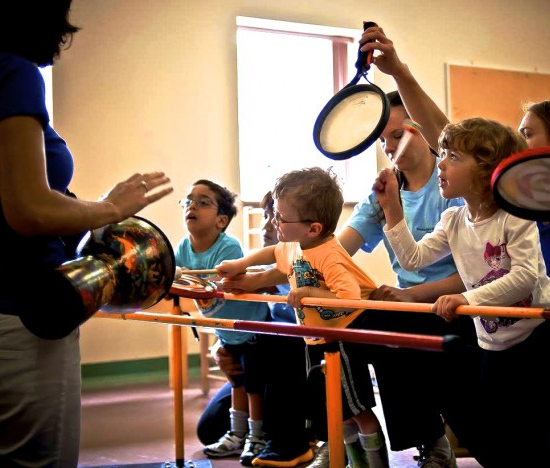 The benefits of music therapy can be the most salient where people are living with multiple issues – neurological impairments with behavioural issues, learning disabilities and communication challenges, or perhaps the loss of multiple senses. In many cases, music therapy can significantly improve their quality of life where other therapies have tried and failed. 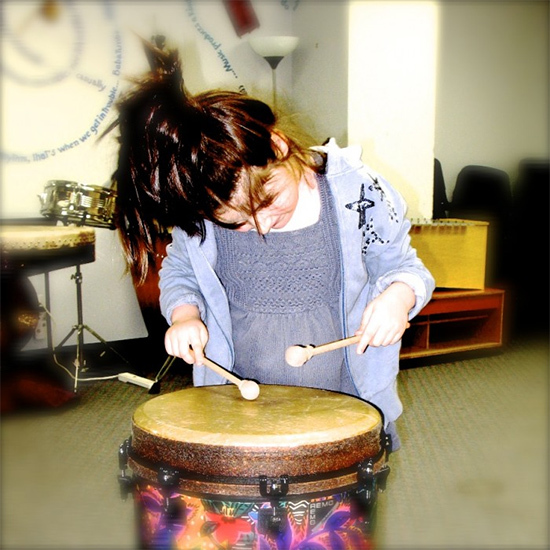 The CMTTF supports music therapists and programs all over Canada, but it’s not financially supported by any government funding or personal benefits, so they rely on sponsorships and fundraising to survive. They’re in their 20th year now, and in their early years they were well supported by the many Canadian music labels around at the time. Today, with the disappearance of all but three major labels, and the advent of online music sourcing, the record companies aren’t in the same financial position as they once were. Today, the CMTTF unfortunately sits on the brink of survival. Their recent fundraiser – a musical march through the streets in 13 cities across Canada – was a great success, but it’s not nearly the amount needed to keep the current programs available. Which is very sad, because when there is something so uniquely affecting and life-enhancing, we shouldn’t allow it to disappear as a tool in health care. As for Elaine, her progress with music therapy didn’t even stop there. 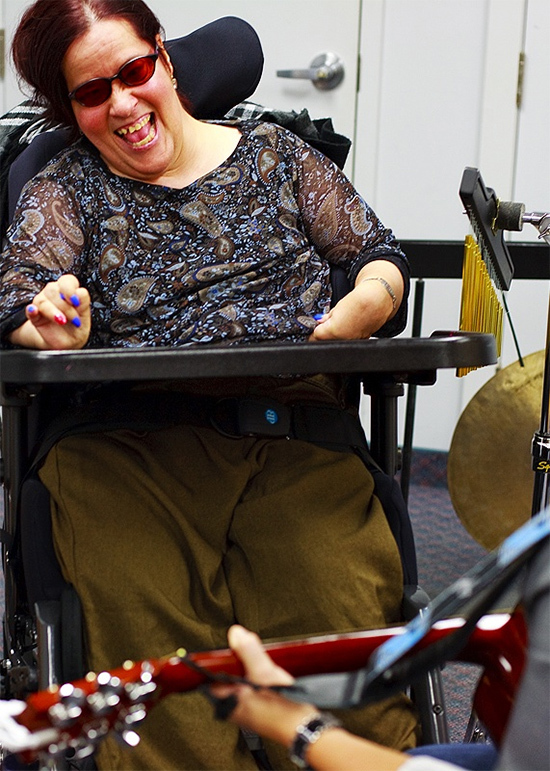 As her program progressed, her music therapist started adding words to the melodic patterns. “Helll – lo.” With practice the woman began to sing simple phrases. On one day, her husband entered the room and she sang: “Hell-o!” They both laughed and cried at the accomplishment. Our musical pathways are found in many areas of the brain. This is why it’s so useful to help people recover their abilities. The musical pathways here helped Elaine to retrain and build new pathways toward speech. Our days here at Compass are comparatively carefree and easy, but we have music as a standard fixture in our environment. I think everyone here feels that it’s an important part of our life at work. It makes our space feel more alive, more social, and in some way just carries us along with the work we do. I see now that the benefits likely run even deeper than that. Note: Elaine’s story is courtesy of the CMTTF. For more information about Music Therapy, feel free to check out musictherapytrust.ca.